Business professionals never think that it will happen to them, but each year mismanagement of sensitive business documents costs businesses just like yours millions of dollars in liability and/or lost productivity. Complete Records Management, Inc. provides full-service document management and document destruction, a more cost-efficient and secure alternative. We can safely transport your sensitive materials to one of our secure shredding facilities and provide you with a thorough Audit and Inventory of all documents that were destroyed via a Certificate of Destruction. 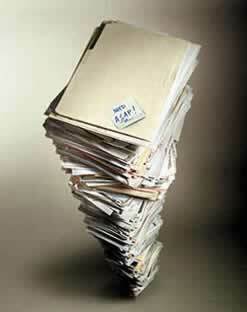 We provide a tailored pick up of your documents to be shredded based on the frequency and schedule you select (i.e. Monthly, Quarterly or Annually). We customize each pick-up to fit each individual client. We shred your documents and sensitive materials, including CDs, diskettes, and microfilm, to meet the highest security standards. We will give you a Certificate of Destruction once the shredding is complete. We want to contribute to lessen our environmental impact by securely shredding your business documents in an environmental friendly facility. All shredded material is 100% recycled, helping to keep the environment free of waste, and saving trees (a vital natural resource).